The LTTE left endowing us with enhanced political strength in the international arena. 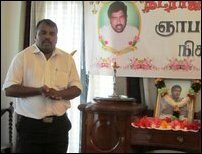 It will be a folly if we don’t know to effectively translate that into political solution addressing to our aspirations, said the Secretary General of the Tamil National People’s Front (TNPF), Selvaraja Kajendren, while remembering the slain Tamil National Alliance (TNA) parliamentarian, N. Raviraj on Wednesday in Jaffna. The present TNA tries to project an image that the Tamils are now weak and they should not demand anything as in the past. This is a wrong projection. It is the political strength and righteousness the LTTE left with us that now makes the IC to poke its nose with seeming sympathy. Their real interests are different, but the space has to be used with firmness and not with naivety on our part, Kajendren said. The IC on its own is not going to give us any solution. But, the IC that has its own vested interests in entering into the island is now impelled to show a face sympathetic to Tamils. They talk of war crimes accountability but they are not prepared to acknowledge genocide, because acknowledging genocide will be acknowledging the need for Eezham Tamil independence. Yet, our political strength that impels the IC to put on a sympathetic face has to be grasped by us intelligently to achieve our aspirations. In this respect the TNA cuts a pathetic figure by playing in the hands of Colombo government, Kajendren said. The fourth anniversary of the assassination of the former TNA parliamentarian, Nadarajah Raviraj was observed at the office of the All Ceylon Tamil Congress in Jaffna on Wednesday. Marking the occasion, 13 families that lost their members in the war were provided with assistance. Diaspora philanthropists have provided the funds needed for the assistance. The memorial meeting was originally scheduled to take place at Chaavakach-cheari, the native town of Mr. Raviraj. But following SL military threats to the hall owners, the venue was changed to the party office in Jaffna. None of the current TNA parliamentarians attended the memorial meeting. Many of the attendees were sad about present TNA showing forgetfulness to its slain parliamentarian.